Interest rates in most Asian countries have reached record-low levels, but are still positive (see Figure 2). The implications of the strategy of the Federal Reserve in the United States and the European Central Bank after the collapse of Lehman Brothers resembles the consequences of the monetary policy of Japan from the end of the 1990s. 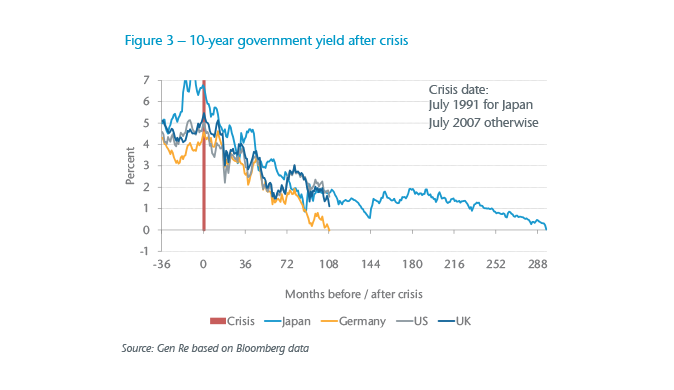 The Japanese example shows that a scenario of long-term low interest rates is not unlikely. A study of such a scenario and the implications for life insurance companies is therefore recommended. The Japanese and German life insurance markets serve as good case studies because in the past, life insurance companies sold policies with guaranteed fixed interest rates that exceeded the interest yield that can be earned today. After World War II, life insurance companies in Japan focused on selling profit-participating, savings-type products through a unique sales channel of “insurance ladies”. In the early stage, this channel included widows from World War II who wanted to provide for their families by selling life insurance policies. At a later stage housewives, who typically had little training and were paid on a commission basis, joined insurance companies. They targeted their relatives and friends who might buy an insurance policy, not because of a need but because of a sense of compassion, which is called Giri or Ninjyo in Japanese. Other agents focussed on developing a close personal connection with potential buyers through frequent home visits with accompanying presents. Such sales activities were called G-N-P (Giri-Ninjyo-Present) solicitations.2 Typical policies were endowment and whole life products, often supplemented by term riders, and fixed annuity contracts. The late 1980s in Japan were characterised by an asset price bubble in which real estate and stock prices were inflated to a great extent. Life insurance companies in Japan at that time issued long-term life insurance and annuity policies with guaranteed fixed interest rates of 4%-6% to compete with the high-interest rates of 10-year insurance policies offered by the state-owned Postal Insurance. Insurance companies supplemented bond investment by investments in equities, loans and real estate as the Japanese government did not issue many bonds with long maturities. The financial markets collapsed and Japan drifted into a deflationary spiral with plunging stock prices, tumbling real estate values and record-low interest rates. In the aftermath of the collapse, Japanese banks were burdened by bad loans and had to be bailed out by the government. This had an impact on the financial service industry as a whole and triggered a loss of confidence in life insurance companies. The asset portfolio yields of life insurance companies dropped continuously from about 6.5% in the year 1990 to about 2% in the year 2000.3 A so-called “negative spread” developed, which was about 2% around the year 2000, resulting from a portfolio interest rate guarantee in the order of 4%. The deregulation of the Japanese financial markets, which culminated in the so-called Tokyo Big Bang, allowed non-life companies to set up life subsidiaries and made the market entry of foreign insurers easier. The number of life insurance companies consequently increased from 30 in 1990 to 47 in 2000. During the period 1997-2001, the combination of a loss of consumer confidence, the negative spread and increased competition resulted in the first seven insolvencies of life insurance companies since World War II. The start of the new millennium in Japan was marked by a continued low interest environment, further declining real estate markets and a volatile stock market that did not recover to historical levels until the present day. The question arises, how did life insurance companies in Japan manage to overcome the challenges of a long-lasting low interest rate period in an increasingly competitive environment? We looked at three key issues. Japanese life insurance companies shifted the asset allocation towards bonds, increased the duration of their bond portfolios to narrow the duration gap between liabilities and assets, and systematically explored inefficiencies in the financial markets. More recently, an increased investment by Japanese life insurance companies into USD bonds can be observed, reflecting a shift to avoid the negative investment returns of Japanese government bonds. In particular the larger Japanese life insurance companies have been looking abroad for investment and growth, e.g. in Australia, Indonesia or United States, as there is little growth potential seen in Japan due to the ageing and shrinking population. Japan has seen a tremendous shift in distribution since the start of the low interest environment – away from the traditional channels and towards skilled, professional advisors, bank assurance, Internet sales and, more frequently, sales through so-called “Insurance Shops”. Banks were gradually allowed to sell insurance products. Life insurance companies took advantage of deregulation and sold savings-type products, such as Variable Annuities, single premium endowment, single premium whole life and annuity policies, over the bank counter. Companies focussing on the Internet distribution channel have been set up in recent years. These companies have attracted attention in the market and have seen significant growth even though the absolute number of policies sold is still relatively low. So-called “Insurance Shops” have also been established, addressing both the need to meet an insurance specialist and the need to gather a wide range of information through the Internet. The shops carry products from a large number of companies and operate on a commission basis. The advice provided in the shops is free of charge for the customer. While interest rate guarantees were still preferred by applicants in general, companies have managed to increase the new business sales of variable life insurance products. The introduction of USD-, Euro- and, more recently, AUD-denominated policies promised a higher nominal investment return but has left policyholders with the exchange rate risk. Variable Annuity contracts, predominantly sold as Single Premium Variable Annuities (SPVAs) through banks, were introduced in the year 2000 and gained significant market share within a short period of time. Sales of SPVAs virtually stopped in the aftermath of the global financial crisis when many life insurance companies suffered significant losses under the financial guarantees of these products. The most important trend, however, was the development of the so-called Third Sector, which includes health insurance policies, cancer insurance products and Long Term Care (LTC) products. This sector had been restricted exclusively to foreign insurers and smaller companies for a long time but was liberalised in 2001, when all life and non-life companies were able to sell Third Sector insurance products. Low claims ratios of such policies allowed companies to dilute losses triggered by the negative spread. Germany is the third largest life insurance market in Europe, with a total gross premium income for individual life insurance of about EUR 70 billion in the year 2014.5 Traditionally, life insurance companies in Germany focused on selling profit-participating endowment products with a conservative interest rate assumption; a slogan traditionally used to advertise policies in the past was “Sicherheit mit Dividende” (security with profit sharing). The Federal Ministry of Finance determines a maximum interest rate assumption, which German life insurers are allowed to use for the calculation of their mathematical reserve. Simply put, this interest rate assumption should not exceed 60% of the average return of 10-year AAA government bonds. 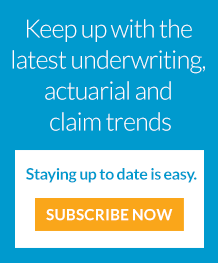 This assumption was typically also applied for the pricing of new life insurance products. This rate has been 1.25% from 2015 and will be 0.9% from January 2017, but was as high as 4% in the past. Due to the existing guarantees in the in-force portfolio and the sharply reduced returns of government bonds, companies have experienced a significant interest gap for new investments in the last few years. 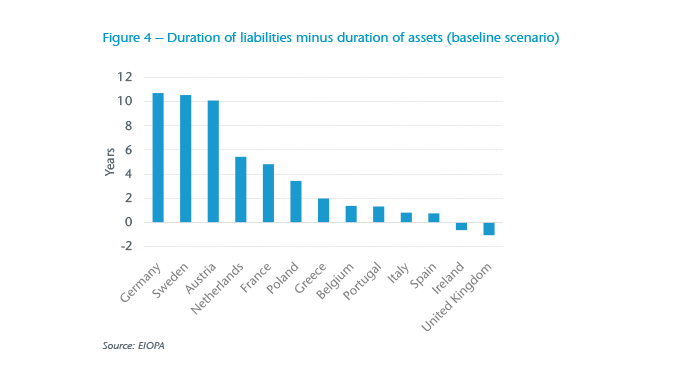 German life insurers furthermore experienced a significant duration mismatch between liabilities and assets, as shown in Figure 4. German life insurance companies hence bear a significant reinvestment risk. 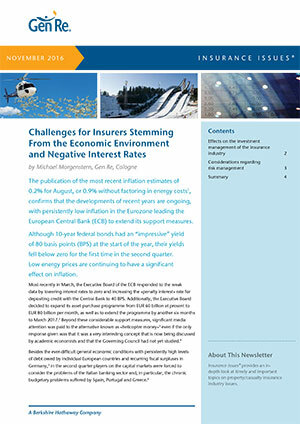 This has also been recognised by the German regulator, and a new balance sheet item, the so-called Zinszusatzreserve (ZZR), was introduced to address the risk of future reinvestment at lower interest rates than the interest rates used for pricing. The ZZR amounts to about EUR 32 billion in the year 2015, which represents about 4.1% of the mathematical reserve held by German life insurance companies.6 It is expected that 3.5%-4.0% of the mathematical reserve will have to be added each year to the ZZR during 2017-2019.7 The ZZR is mainly funded by realising hidden reserves. The question then arises, how do life insurance companies in Germany react to the challenges of a low interest rate period? We explore two areas. The investment strategy of German life insurers has traditionally been conservative, with 87.3% of assets invested in bonds and 4.3% of assets invested in equities as of 31 December 2015.8 A shift of investments towards more risky asset classes would, under Solvency II, increase capital requirements. German life insurers have instead focussed on increasing investment into less liquid investments and taking advantage of the liquidity premium built into the return. Such investment includes infrastructure projects, such as solar and wind energy, parking garages, and gas distribution systems. The dominating products traditionally sold in the German market have been endowment products, priced with conservative interest rates and mortality rates. Sales arguments included annual investment returns in excess of 7% (which contrast with about 3% for the in-force portfolio today) and exemptions from taxes on interest earned under life insurance policies. Such endowments have been replaced to a large extent by traditional deferred annuity products, especially since tax advantages were removed for endowment products in 2004. 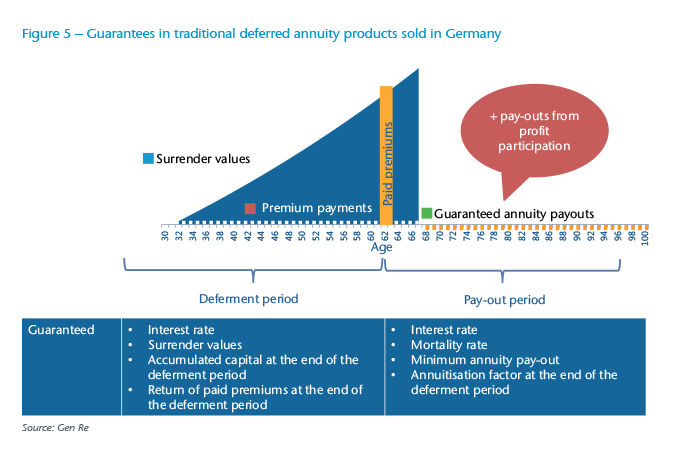 Traditional deferred annuity products sold in Germany provide substantial guarantees during the deferment period but also during the pay-out period (see Figure 5). These guarantees trigger large capital requirements under Solvency II. Disability income business is the most important German protection-type product. New business is about 400,000 policies per annum. There is significant need in Germany for private LTC protection in view of the ageing population and gaps in the benefits of the public LTC system. In 2014 there were about 3.4 million policies in force, 95% of which were policies sold by health insurers and the remaining 5% by life insurers. Health insurers experienced a growth rate of about 15% whereas life insurers have seen a growth rate of about 25% during 2010-2014. The experience of insurance companies in Japan and Germany during the period of low investment returns shows that the companies that focused on sales of protection-type products fared better than the companies that focused on investment guarantees. In addition, new and innovative distribution approaches (e.g. approaches using the Internet to attract customers, as experienced in Japan) continue to challenge the traditional sales approaches.